Fifty years after the events of ALTERED CARBON, Takeshi Kovacs is serving as a mercenary in the Procterate-sponsored war to put down Joshuah Kemp's revolution on the planet Sanction IV. He is offered the chance to join a covert team chasing a prize whose value is limitless -- and whose dangers are endless. Here is a novel that takes mankind to the brink. A breakneck-paced crime thriller, ALTERED CARBON took its readers deep into the universe Morgan had so compellingly realised without ever letting them escape the onward rush of the plot. BROKEN ANGELS melds SF, the war novel and the spy thriller to take the reader below the surface of this future and lay bare the treacheries, betrayals and follies that leave man so ill-prepared for the legacy he has been given: the stars. This is SF at its dizzying best: superb, yet subtle, world-building; strong yet sensitive characterisation; awesome yet believable technology, thilling yet profound writing. 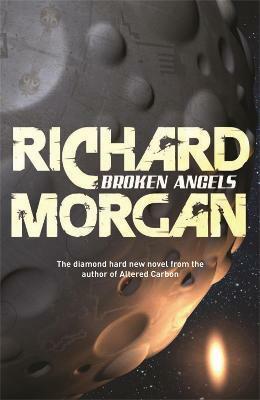 Richard Morgan is set to join the genre's world-wide elite.